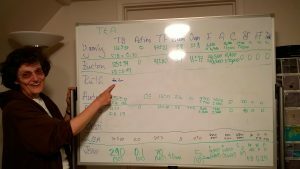 Last week I attended a five-day soil science class with research scientist Dr. Elaine Ingham, just outside of Oroville, CA, where they say Ahmonds when referring to Almonds. 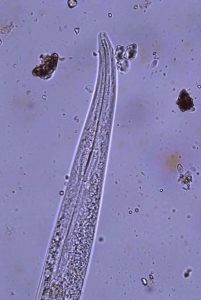 Seven of us hovered over microscopes much of the time, counting nematodes, protozoa, and bacteria. Near the end of each day, it was hard to differentiate the floaters in our eyes from the Oomycetes we were trying to measure. By Thursday I accomplish something very special – how to correctly place the cover slip on the slide. Seriously, this is an important step. By the time you are done measuring the volume of an organism per gram of soil, by taking five counts from each of five sections of each slide, you hope your standard deviation is at an acceptable level. A way to increase the reliability of your data is to master the art of the cover slip. On Tuesday, I ask Elaine, who never refuses anyone’s questions, if I can watch her put the cover slip on the slide. Instantly I hear chairs screech as the other students dart over to watch. Elaine, with the grace that comes from 40 years of doing anything, places the edge of the cover slip on the slide and we watch the drop of water disperse along the edge of the slip. Then she sweeps back and forth, back and forth and drops the slip. I take a breath and try it again myself. As soon as I start my slide I realize I have missed some step. I drop the cover slip and there is an air bubble and all of the visible organic matter is under 20% of the cover slip! By Friday, we have completed everything on the agenda (white board photo) and have bathed in the knowledge of Dr. Ingham for a whole week (except for half a day when a film crew from Johns Hopkins was visiting the farm). I am certain it was the most worthwhile and enjoyable investment in education I have made. 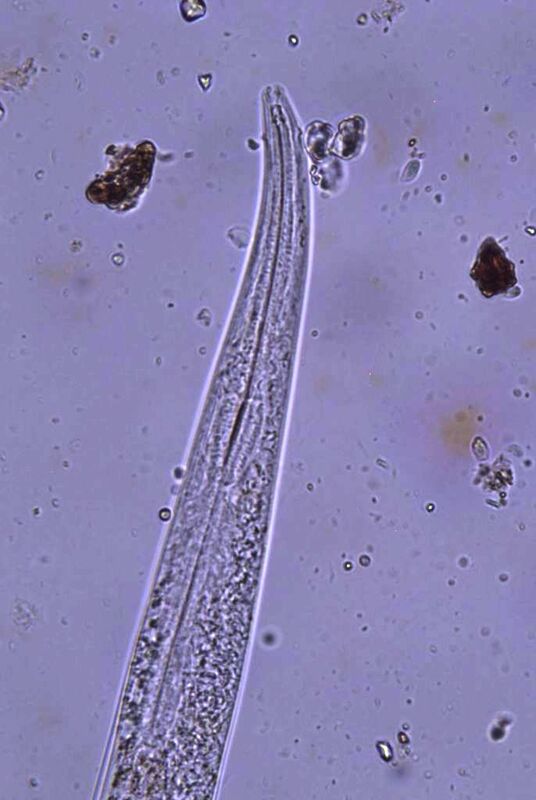 This entry was posted in Plants and tagged Elaine Ingham, microscope, nematode, soil science on May 27, 2018 by Ruth. 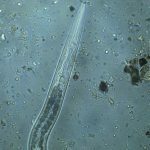 It’s time to honor our important volunteers who live in the soil – the nematodes, protozoa, microarthropods, fungi and bacteria. All these fellows work tirelessly underground, decomposing organic matter and pooping out the nutrients in the form that plants can use. In fact, organic matter is the only food we have supplied for the orchard trees and shrubs over the last six years. And, now that we are using the thermal compost process (see Nov. 2017 blog), we will be regularly cooking up tasty treats our plants enjoy. Plants put out sugars in their root zones to attract the critters they most desire. 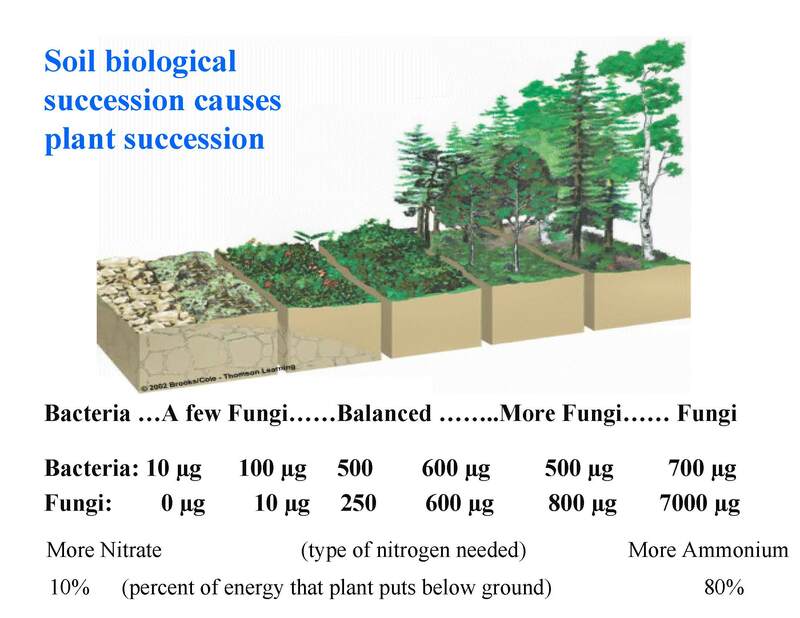 Early succession plants, like weeds, desire soil with more bacteria (see Ingham slide). 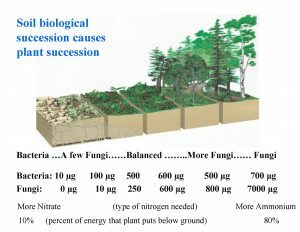 Late succession plants, such as deciduous and conifer trees, prefer fungal dominated soils. When we make our compost, the types of inputs we use will determine whether the compost will also be bacterial or fungal dominated. How do we test the characteristics of our compost? 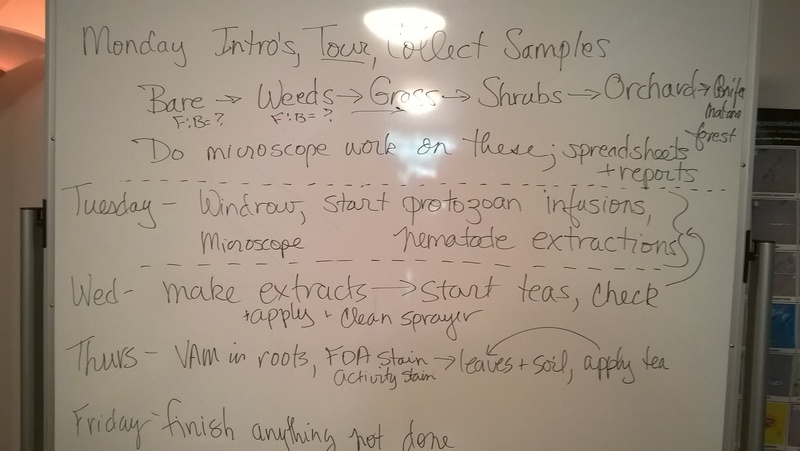 We can put the finished product under the microscope and actually count how many bacteria, fungi, protozoa and nematodes we have and then convert the counts to biomass. 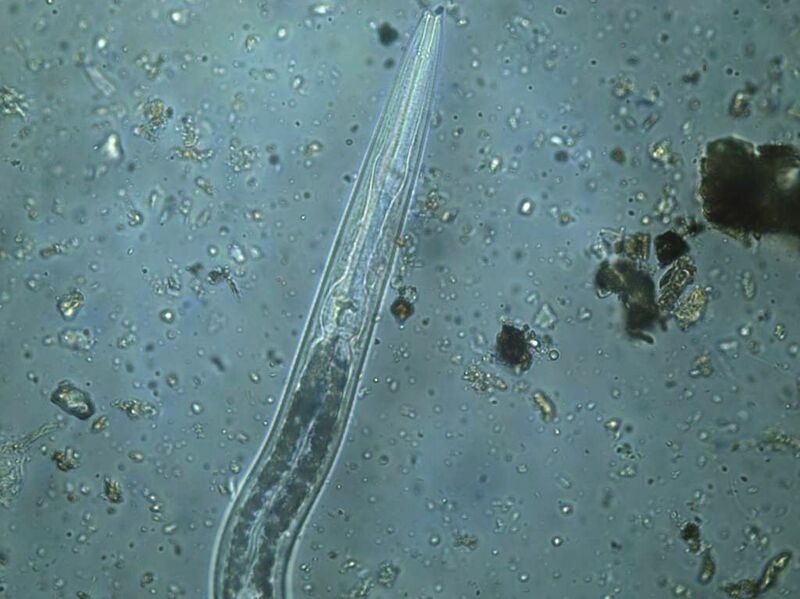 Dr Elaine Ingham offers very accessible online classes in soil biology, making compost, compost tea and using microscopes to test soil life. She discounts classes at various times of the year. 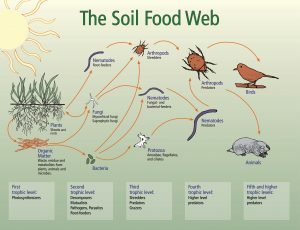 If you take these classes, you will learn how to be a good land steward (see Ingham’s soil food web slide). You won’t remember but, when seed plants arrived over 360 million years ago, good soil biology was already in place. Plants know what they need from the soil and how to get it. We can all play a part to improve soil quality by minimizing soil compaction and avoiding use of inorganic fertilizers. 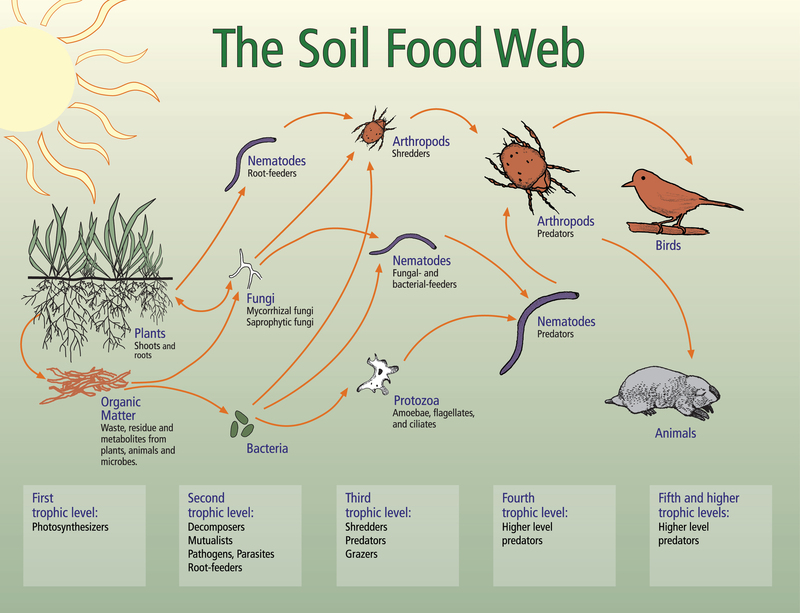 The importance of soil is the subject of this recent article from the New York Times. 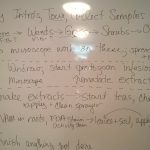 This entry was posted in Plants, Uncategorized and tagged nematode, plant succession, soil microbes, steward on December 19, 2017 by Ruth.